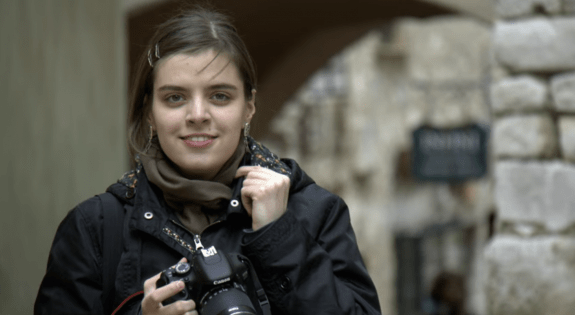 Journalist Anna Lelik took on her first investigative report when she was just 17. She was looking into online censorship in Central Asian countries — including in her home country of Kyrgyzstan — and was worried she wouldn’t be taken seriously as a journalist. Luckily, her first big interview was over the phone, she says at TEDxYouth@Tallinn, so her interviewee couldn’t see that she had just graduated from high school. When Kloop first started, it was hard to get “grownup journalists” and the public to take them seriously, Lelik says, but everything changed once the site started covering the Kyrgyz Revolution of 2010. “The other media — with the grownup journalists — only covered the official side of the story [with] the comments of the state — or [they] kept silent, while protestors stormed local administration in the provinces,” Lelik says. Kloop journalists were on the scene during these clashes, Lelik says, and the internet turned to these young reporters for coverage of the events. “Hundreds of thousands of users visited our website [during the April revolution],” Lelik says, “and step by step we started gaining more trust.” Soon, Kloop was being quoted in outlets like the New York Times, the Guardian, and the Associated Press. It became the fifth most popular news website in Kyrgyzstan. As Kloop grew, it began to take on more in-depth investigative reports, live broadcasting, and news video. One of their reporters discovered the illegal construction of mansions in a green park, Lelik says, by flying a drone camera over Bishkek. Another story focused on the unfinished construction of a hydroelectric plant and the bids for construction that went into its planning. In 2016, the president of Kyrgyzstan mentioned Kloop for the first time in a public speech. It was a critique, but Lelik says she thinks that’s the best compliment they could get — and a sign that the country takes Kloop seriously. To learn more about Kloop, watch Lelik’s TEDx talk. To learn more about journalism, watch this TED-Ed Lesson. Photo credit: Bektour Iskender. Author bio: Hailey Reissman writes for TEDx Innovations Blog.